Ainol Novo 10 Captain will be the third 10.1 inch tablet released by Ainol. It uses a 1280×800 pixel 180 degree viewing angle IPS capacitive screen made by LG and runs Google’s latest Android 4.2 Jelly Bean (the same OS on Google Nexus 7). NOVO 10 Captain is powered by a 1.5GHz ACT-ATM7029 ARM 2nd generation Cortex-A9 based quad-core CPU with built-in dual-core GC 1000. The RAM is 2GB super fast DDR 3. It has dual-cameras – 0.3MP front facing webcam and 2MP rear facing camera. NOVO 10 Captain has HDMI port so that you can play video and games on your big screen HD TV. Ainol NOVO 10 Captain has Google Play (Android Market) pre-installed. It supports bluetooth 2.1, so you can connect it with bluetooth keyboard (like our uPlay wireless keyboard case) and bluetooth game controller. Ainol NOVO 10 Captain has a supper large 11000 mAh battery, so you can enjoy playing game or surfing web for 10 hours without charge. 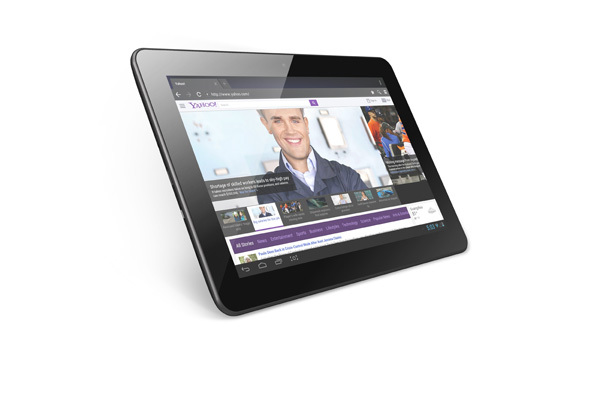 Categories: 10.1" tablets, Ainol tablets, Tablets, Tablets with bluetooth. 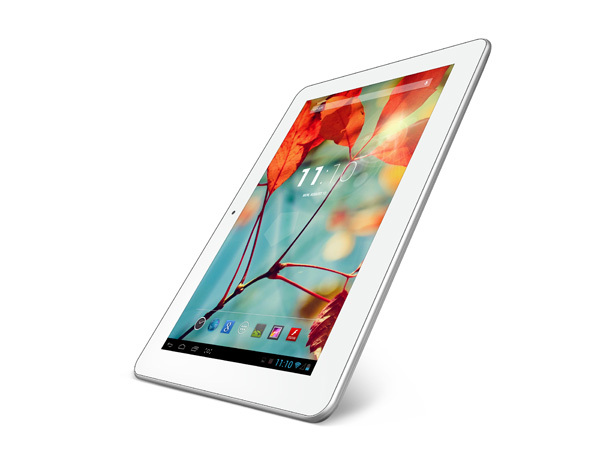 Tags: 10.1" tablets, Ainol NOVO 10 Captain, Ainol NOVO tablets, Ainol tablets, Android 4.2 Jelly Bean tablets, Bluetooth, IPS screen, Quad-core. IN STOCK . One day special $199.99. Stocked in CA for US customers. Orders from other customers are shipped directly from factory in China. Oct. 15: We have got US charger for Captain. Sept 16, 2013: Ainol NOVO 10 Captain only comes with EU charger. There is no US charger. Aug 23, 2013: We have received NOVO 10 Captain from Ainol. All pre-orders will be shipped out in the next couple days. Aug 6, 2013: Ainol has confirmed the Captain English edition will be released by end of August. However, the hardware spec won’t be the same as the original one published in Oct. 2012. Three major upgrades: OS is upgraded from Android 4 .1 to Android 4 .2 Jelly Bean, memory is upgraded from 1GB to 2GB, the battery is upgraded from 10,000 mAh to 11,000 mAh. Two major downgrades: GPS is removed and the screen resolution is down from 1920 x 1200 to 1280 x 800. Considering those changes, we have reduced the sale price from $259 to $229. We of course still honor all pre-orders ($219), but if you decide to cancel your pre-order because of the spec change, we fully understand, just let us know. If you don’t want to wait, we actually have two models, one 10.1″ one 9.7″, available now. Although the price is higher than Captain pre-order price ($219), we can ship you either of those two model if you decide to do so without extra charge. July 19, 2013: Ainol has released Captain Chinese version. The English version will be released by August. All pre-orders will be shipped by that time. April 02, 2013: Ainol didn’t release Captain according to its original schedule. The released date is not finalized. The price at the release will go up to the $260 to $300 range. We will honor our pre-order, which was priced at $219.99. Nov 19, 2012: Ainol showed its roadmap at China Electronics Fair held in Hong Kong in Oct., one of them is a 10.1 inch NOVO 10 Captain with quad-core CPU, 1920×1200 pixel IPS screen , 0.3MP front camera, 2.0MP rear camera, bluetooth , and GPS. Comparing with the other 10.1 inch tablet announced by Ainol, NOVO 10 Hero, NOVO 10 Captain uses a reference design from another provider. The release date is not disclosed yet. The latest news from Ainol is that Captain will be released in Q1 next year. If you want a 10″ tablet now, you should order Ainol NOVO 10 Hero, which is very similar to Captain except the dual-core CPU. The selling point of Ainol NOVO 10 Captain ; other than its quad-core CPU are its super high resolution IPS screen , super large battery, and built-in GPS and bluetooth . Ainol NOVO 10 Captain shares the same metal case as NOVO 10 Hero. As Ainol’s oversea distributor , we take pre-order of Ainol NOVO 10 Captain now for a special pre-order price ONLY$269.99 $259.99 (16GB version). You can cancel your order any time before shipping by using the form in “Contact Us“. Ainol Novo 10 Captain will be the third 10.1 inch tablet released by Ainol. It uses a 1280×800 pixel 180 degree viewing angle IPS capacitive screen made by LG and runs Google’s latest Android 4 .2 Jelly Bean (the same OS on Google Nexus 7 ). NOVO 10 Captain is powered by a 1.5GHz ACT-ATM7029 ARM 2nd generation Cortex-A9 based quad-core CPU with built-in dual-core GC 1000. The RAM is 2GB super fast DDR 3. It has dual-cameras – 0.3MP front facing webcam and 2MP rear facing camera. NOVO 10 Captain has HDMI port so that you can play video and games on your big screen HD TV. Ainol NOVO 10 Captain has Google Play (Android Market) pre-installed. It supports bluetooth 2.1, so you can connect it with bluetooth keyboard (like our uPlay wireless keyboard case) and bluetooth game controller. Ainol NOVO 10 Captain has a supper large 11000 mAh battery, so you can enjoy playing game or surfing web for 10 hours without charge. We will include HDMI cable as free gift for all NOVO 10 Captain pre-orders. Ainol NOVO 10 Captain has 10.1 inch IPS screen at 1280×800 high resolution made by LG . The IPS screen supports all angle viewing – you can see the picture and video clearly within the 180 degree viewing angle. IPS screen also has much better black color than the normal high resolution screen . You will be amazed the the clarity and true color of NOVO 10 Captain’s screen, particularly when playing games and watching movies and sports. Google has made numerous improvements on its latest Android OS – Jelly Bean 4.2. Google used to play a catchup game with Apple iOS, but it becomes almost as good as iOS starting from Android 4.0 Ice Cream Sandwich . In order to release its own tablet in this Summer, Google worked with Taiwanese computer maker Asus very closely, fine tuned its OS in every detail, and released this Android 4.1, so called Jelly Bean. Google upgraded Android 4.1 to Android 4.2 this year. 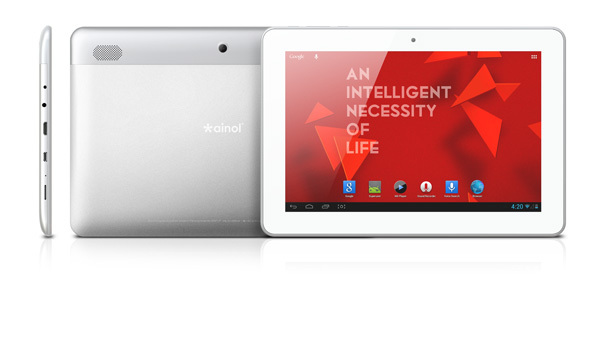 Ainol NOVO 10 Captain is the second tablet released by Ainol with Android 4.2 ( the first one is Ainol NOVO 7 Venus), so Ainol has learned from its Venus experience, and fixed bugs that found in Venus. The CPU of Ainol NOVO 10 Captain is the latest 1.5GHz quad-core ACT-ATM7029 (ARM Cortex-A9 based) processor and Quad-Core GC 1000. ACT-ATM 7029 is the first quad-core CPU seen on Chinese made tablet. Its CPU is based on mainstream ARM Cortex-A9 , the second generation of ARM CPU. The GPU is GC 1000 by Vivante. ACT-ATM7029 is made with 40nm process technology, which is about 2X faster and consumes about 1/2 power than other CPUs made by 65nm process technology. The performance of this quad-core should be close to the quad-core CPU used in Apple iPad 3 . NOVO 10 Captain supports bluetooth 2.1. Bluetooth offers huge flexibility when connecting to a third party device. It not only allows you to connect your tablet to bluetooth earphone for talking in Skype and enjoying music wirelessly, but also allows you to type with a bluetooth keyboard , or play game with a bluetooth controller. For example, it works with the our uPlay Wireless Keyboard Case for iPad and uPlay Wireless Keyboard Case for Nexus 7. Just keep in mind, none of those keyboard are designed for 10.1 inch 16:9 tablet, therefore, it won’t fit Ainol NOVO 10 Captain as a case – you can only use it as a keyboard. Ainol NOVO 10 Captain uses a a super large 11000 mAh battery, while most of the 7 inch tablets ’ battery is about 3000 mAh, and most of the 9. 7 inch tablets ’ battery is about 5000 mAh. Battery is one of the most important factors to consider when buying tablet. Most of the Chinese tablet makers are trying to use less capacity battery to reduce cost, while Ainol always selects the largest capacity battery for the best user experience. With one full charge of this 10000 mAh battery, you can listen to music for 12~15 hours, play video and 3D game 8 hours, and surf web for 8 hours. Keep in mind most of those performance tests were measured when WiFi is off or screen is off, so the real performance number will be slightly lower. Ainol NOVO 10 Captain has both front facing and rear facing HD cameras. The front camera is 0.3MP, the back camera is 2MP, not impressive comparing with the camera on NOVO 10 Hero. You can use them to shoot photo, record video, and conduct teleconference. You can switch between front and rear camera in apps. Skype is supported. Ainol NOVO 10 Captain supports Google Play . Google Play is pre-installed on NOVO 10 Captain – you can access and download more than 400,000 apps directly from your tablet. Ainol NOVO 10 Captain supports Full HD 1080P and other HD formats. Once you connect it to your HD TV via the HDMI cable (free gift from uPlay Tablet ), it automatically recognizes HD TV connection, and output video signal to TV. It displays on both tablet and TV for all operations. 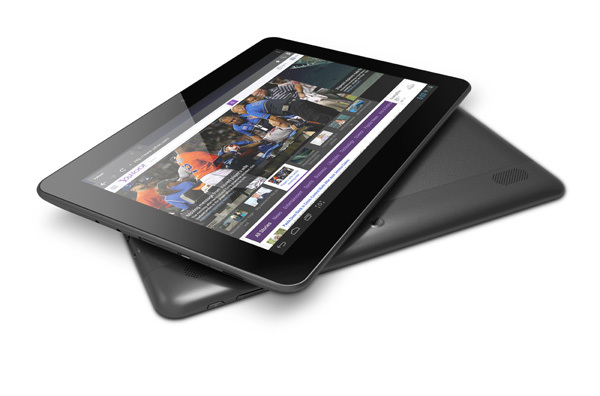 Ainol NOVO 10 Captain has 2GB DDR3 RAM (most tablets have 512MB memory). DDR 3 RAM is the latest memory technology, and it’s 2X faster than DDR2 RAM. Large memory allows numerous tasks and apps to be run at the same time with no loss in speed or responsiveness. Furthermore this allows data to be processed faster, meaning 3D games run better than ever! 1280×800 pixel screen used on Ainol NOVO 10 Captain has higher pixel density than 1024×768 pixel screen commonly seen in those 9. 7 inch tablets and 1024×600 pixel screen in those 10.1 inch tablets. It supports 5-Point Mult-touch plus ALPS touch buttons. 1280×800 pixel high resolution and 10.1 inch IPS 180 degree angle display enable excellent performance for playing games and watching videos on Ainol NOVO 10 Captain. Ainol NOVO 10 Captain’s WiFi chip is made by Broadcom – the industry leader on WiFi chips. It supports WiFi standard 802.1 b/g/n with a maximum speed of 300M. The WiFi chip in most of the Chinese made tablets are designed by either domestic fabless companies or design companies in Taiwan. WiFi compatibility is one of the common issues that we have seen (other than battery and charging). The Broadcom WiFi chip has better compatibility. NOVO 10 Captain also supports external 3G dongles (see supported 3G dongle list at the end for more details). NOVO 10 Captain has 3 axis gravity sensor, super sensitive. The gravity sensor is a common feature in pretty much every tablet. However, the sensitivity is different. Ainol always picks the most sensitive gravity sensor for their tablets. Captain has 2GB RAM, Hero II has 1GB RAM. Hero II’s cameras have higher resolution than Captain’s. Captain has a bigger battery than Hero II, although Hero II’s battery capacity is very large, too. You might be able to find some online stores selling Ainol NOVO 10 Captain for a few dollars cheaper, but all of those stores are selling the Chinese version for the China domestic market – the default language in the tablet, reference manual, product warranty card, and package are all in Chinese. Most of those stores are based in Shenzhen, China. It would cost your $40~$60 to ship your tablet back to them if you need replacement or repair, while uPlay Tablet is Ainol’s distributor in North America, our office and customer service are in Silicon Valley, California, your return and repair are handled in California as well. Check out our Ainol NOVO 10 Captain support forum. Have a question about this tablet? ask your question here. You will get answer by email.